SanDisk Headquarters — Valerio Dewalt Train Associates, Inc.
SanDisk is an engineering driven culture. Their existing workplace environment was designed solely towards focused independent work. With a desire to foster cross-collaboration of ideas the leadership at SanDisk recognized a need for a workplace that encouraged interaction between colleagues. Designing a collaborative environment was something that was understood, but selling this change to the workforce was the challenge. The design team interviewed every senior leader in the company to understand how to begin transforming the 600,000 sf campus into a collaborative workplace. 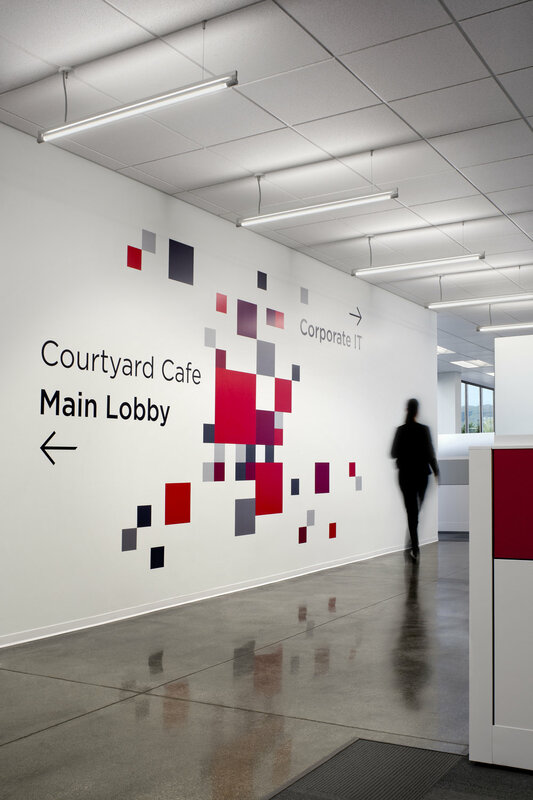 SanDisk’s business environment is reflected in a workplace that is functional with an emphasis on study and large, organically grown electronics labs where engineers spend their day. Lower panel walls and smaller private cubes were traded for larger lab spaces and more collaborative and teaming areas. The outcome was an interior that expressed the fundamentals of their product. The dominant color was white - expressing the precision of their technologies, red was added as an expression of the company’s innovation, and a warm-tint wood was used to express the new culture of collaboration.